If, like us, you intend to give priority to photography during your thru-hike, there are a few question to ask yourself before taking the plunge and buying expensive gear. Reflex pro, semi-pro, Hybrids, Compacts… Nowadays, the offer in the photography market is dizzying and it is often difficult to find oneself! What kind of camera do you need? Do you need lenses? Which ones? What about accessories? The offer is gigantic but your needs are often well defined, so don’t get lost. If you are going to Thru-hike or Section-hike for weeks or months, this adventure will probably be a positive upheaval and undoubtedly an episode of your life which you will be glad to have traces. Before you invest in photo equipment, define your needs and constraints. I have been fashion photographer for 8 years. Jumping to outdoor photography brought a new whole bunch of questions on the table. 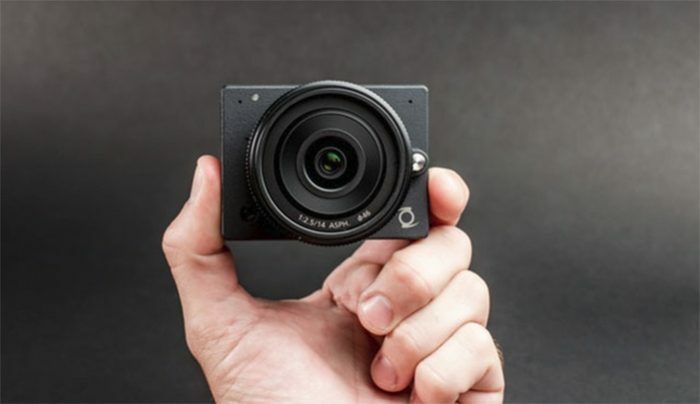 The compact camera is characterized by its small dimensions. The lens is non-detachable and retracts into the body when the camera turns off. 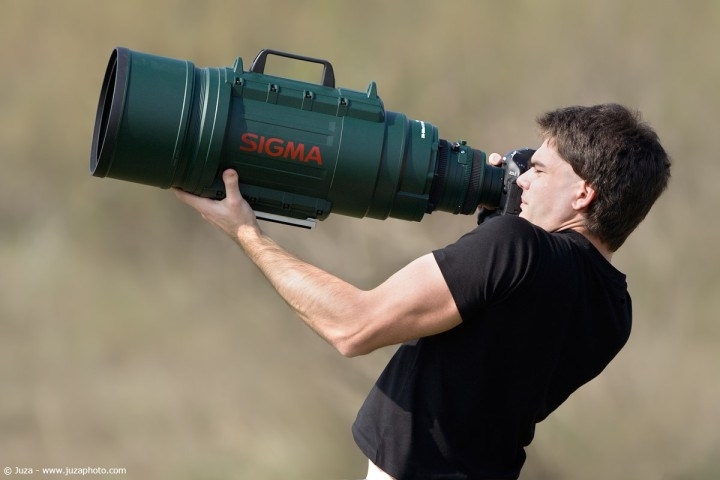 The zoom capability can range from 3x to more than 10x. It is possible to manually adjust the exposure, but the focus is automatic as it does not have a focus ring due to its retractable lens. The Compact is the camera for beginners but also for the most weight conscious and most of the thru-hikers carrying photography gear. Its small format makes it a very handy device and automatic modes make it’s use very simple in many circumstances. These photography cameras can offer great results for everyday use in photography. Some Expert Compacts are even, let’s say it, excellent. The Hybrid functions as a Compact: ease of use, electronic viewfinder, auto-focus with contrast measurement. Lenses are often interchangeable but do not have an optical viewfinder. Each brand has its dedicated lenses park only compatible with the brand’s enclosures, which can be quite restrictive. But the hybrid lenses parks are growing, thus offering more and more choices. Here too, the lens is interchangeable, allowing the camera to be adapted to the particular needs of a photo type. The sensor is much larger than in a Compact or Hybrid, which allows greater image quality and increased capabilities at night or in low light. All settings can be controlled manually, which offers great freedom in many situations. The sturdiness of the equipment is a key criterion in all outdoor photography activities. We are often a little afraid to have a Reflex for companion in this kind of adventure, nevertheless, if the pro Reflex are still used by more than 90% of the photo reporters, it is also for their solidity. Today, many manufacturers offer cameras with very good standards of waterproofness and solidity. What will be the conditions of use? Will the camera be permanently in a hiking bag or protected in a good photo bag? Will you face difficult climates? Will you use it intensively every day? Does your equipment really need to be off-road? Do not neglect the importance of the robustness of your hardware, it is essential that you have confidence in it! Even for Hybrids and Compacts, there are official standards especially in terms of waterproofness and solidity, inquire before making your choice. On many sites, comparators can guide you through this maze of standards with barbaric names. In the case of DSLR, at an equivalent price, it is sometimes better to opt for a former professional model, often more solid, than to absolutely want to equip yourself with the latest model with more functions but a lower built. 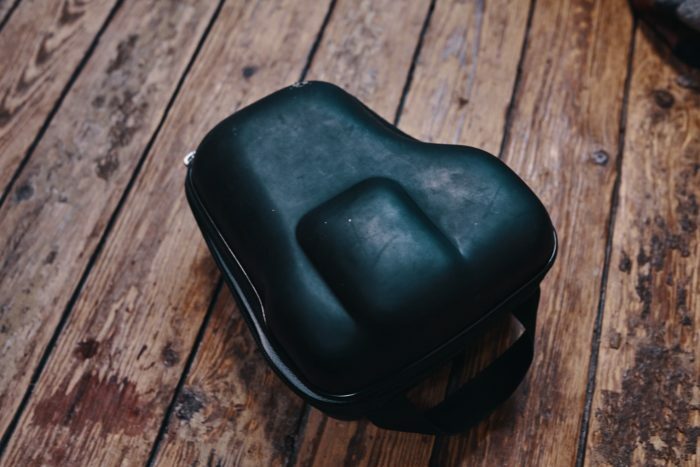 Before you decide, it is interesting to also look at the protective accessories that you can find for a given camera, you need to protect your photography equipment well ! 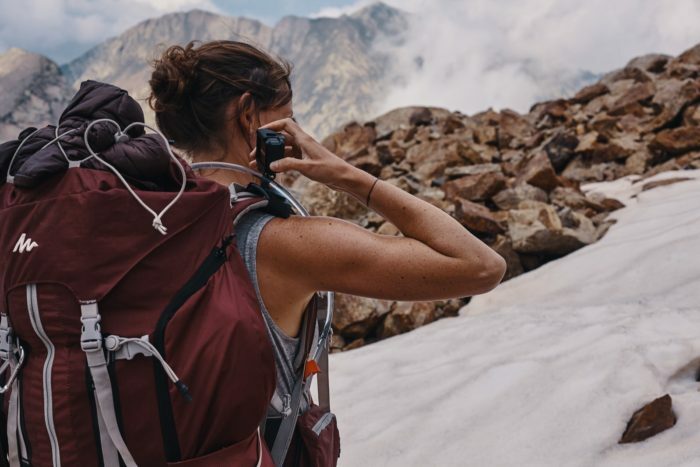 To carry out a long-distance hike of more than one year, we know that it will be essential for us to have solid, well-proven equipment, durable, stable and with sufficient notoriety to benefit from an efficient after-sales service. 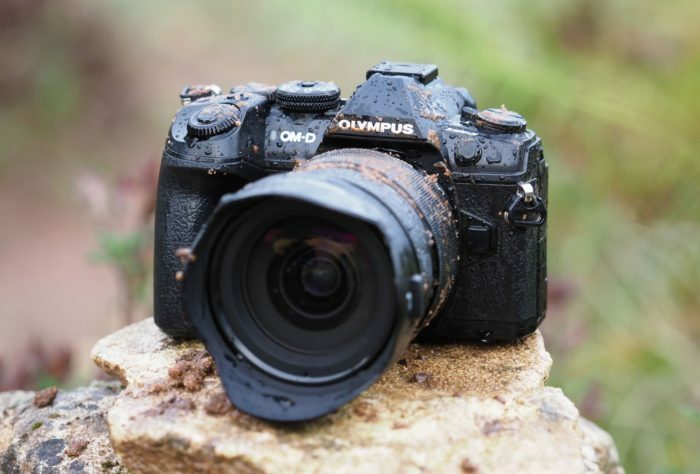 If the New Olympus OMD Em1 MKII got so much attention from us it is also because of its ability to resist any weather! It can be very frustrating to be lacking of a wide angle lens for landscape photography or on the contrary not to be able to take pictures of the people you cross without approaching within two meters. Choosing your goals will be crucial. Here is one of the limits of the Compact: even if the zoom gives you often a good range, the lens is not interchangeable. To some extent the Hybrid gives more freedom and some brands have definitely great lenses options but it is especially one of the major advantages of the Reflex: the size of the optical park. If you opt for a DSLR the possibilities will be almost limitless. Are you rather focused portraits, sport or would you like to equip yourself for landscape? Maybe a little bit of everything? If the range of lenses proposed by the manufacturer of your camera seems to you too restricted, look also at other manufacturers of the style Sigma or Tamron or on the side adaptations rings. They allow to interchange the frames between different brands, you can for example mount an old Nikon lens on a Olympus camera. These rings are sometimes provided with an electronic chip for the focus and can then present good alternatives, or even fill gaps in your lenses collection. 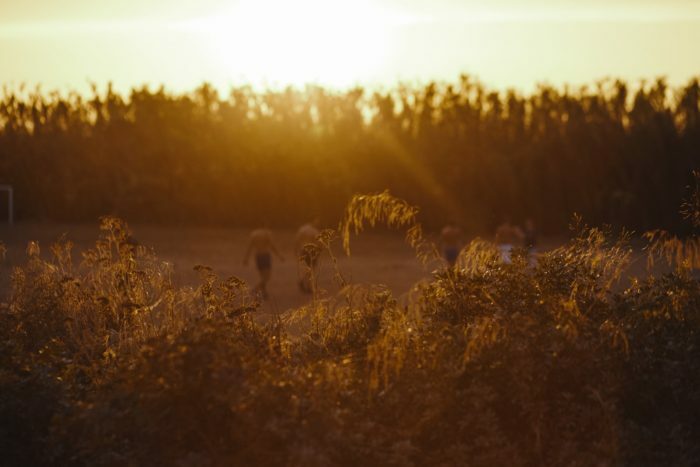 In our pictures, we like to mix portraits with landscapes and scenes of life. In video we do not use zoom and always prefer to work our frames with fixed focal lengths. Moreover, we often find ourselves taking pictures in low light conditions which naturally pushes us towards very high aperture lenses and therefore fixed focal lengths. Each of these sizes has advantages: if the large sensors are a guarantee of quality, the APS-C have a larger zoom factor while being less bulky. 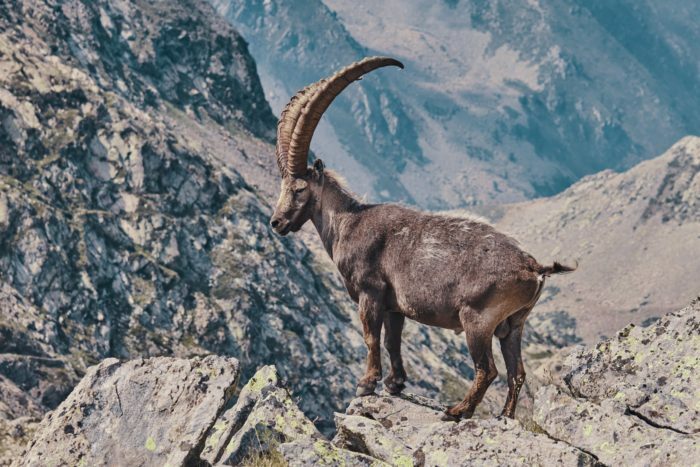 For example, for wildlife photography or sporty epic trails shot, it may be wise to turn to an APS-C. 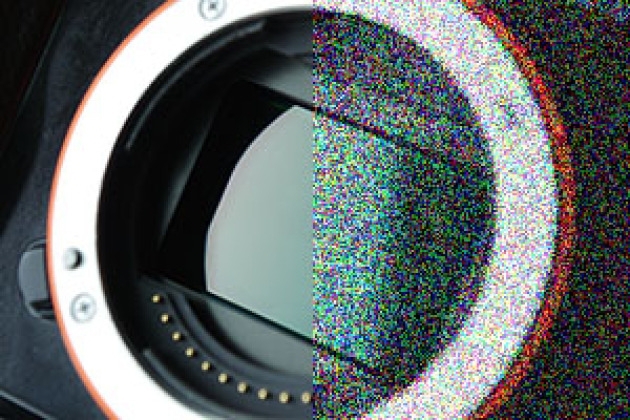 Featuring a sensor with a small area, the image is “cropped”: the focal length is multiplied (between x1.4 and x1.6 depending on the manufacturers). 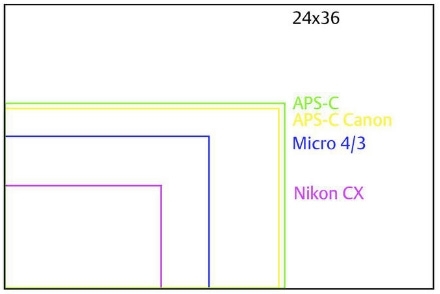 Example: A 200mm lens on an APS-C is equivalent to a 300mm on a full frame. And obviously, these two lenses will not have the same price. Several indivisible factors contribute to the magic that makes a digital image what it is. As you can see, megapixels do not mean everything. We find mobile phones with as many megapixels as professional devices, yet the difference is still very clear. What will be the medium of diffusion of your images? Do you need to shoot your images in large format or on the contrary are they meant for a screen? Do you get to shoot a lot at night or with low light? Do you often work with large aperture (a lot of blur)? Megapixels? Size of sensor? Processor ? Difficult to understand sometimes what makes the quality of the images of a device. Here is a few lines that could just as easily be explained in several pages. The sensor is made up of photovoltaic cells that measure the intensity of the light and its color. This luminous intensity is then transformed into electric current. 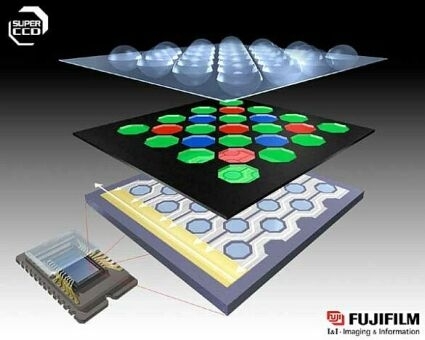 Each point of the sensor that composes a part of a pixel records the light intensity and produces an image. A pixel is therefore made up of several voltaic cells, called photosites. Thus, with equal number of pixels, the photosites will have less space and will be smaller on a small sensor than on a full-size sensor. The tighter the photosites, the more they generate electrical interference that interferes with each other. These interferences can cause digital “noise” in the photos, in other words, the appearance of tiny, more or less colored dots. Smaller photosites also receive less light due to their small area, resulting in a drastic drop in quality as the brightness decreases. This is why large sensors are much more efficient at night. In addition to the number of pixels and the size of the sensor, it is also the processor which will play a key role in the image restoration process by performing a treatment on the photo a posteriori. At the top of the ladder, the best-in-class photography camera combines: high-quality optical components, an optimal size sensor for maximum light capture, enough pixels to capture all the details of an image and incorporates advanced image processing via the processor. 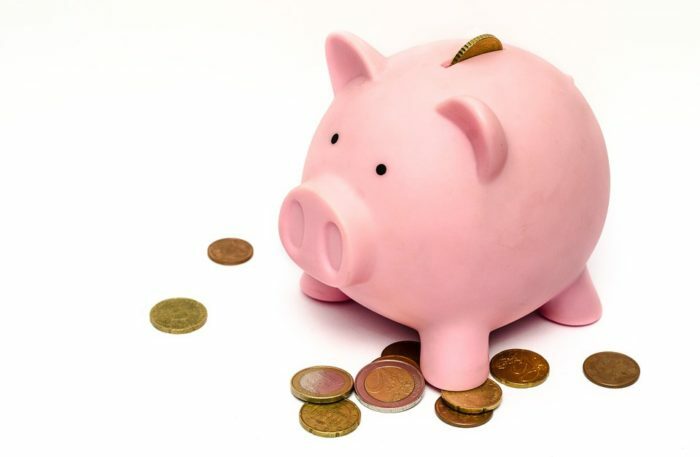 If you have a budget and / or a limited weight, analyze your needs in terms of image quality and final medium to make the best choices and do not overburden or ruin you unnecessarily. Try the equipment, project yourself in real conditions. Do not hope to do clean night shots with small sensors 🙂 You have to find the right balance! Being a photographer for about eight years, I usually work with DSLR full frame. Being able to make large prints of my images is a priority so I needed to work with a resolution of at least 20 megapixels, with the best quality. Also, we do not do a lot of photography at night but still wanted to be able to take pictures at night without too much “noise” in our photos. In this article we will not speak about the video cameras but of the versatile cameras. Some of you, like us, are looking forward to shoot photos and videos with one device. Video standards are constantly evolving, so is our eye, often critical and demanding, it expects more and more quality. 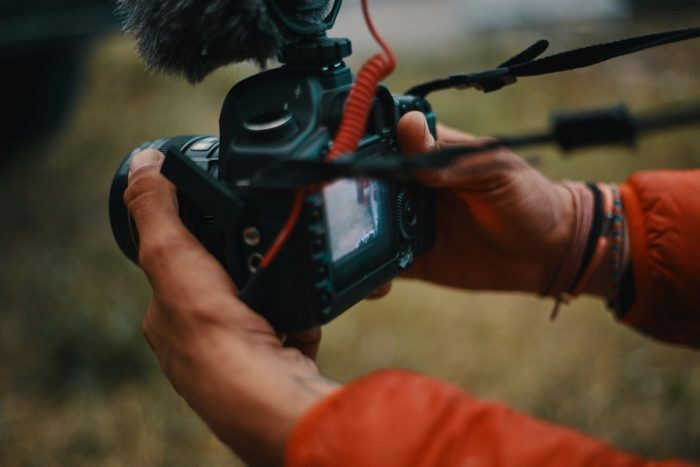 Who says video says other a total different dimension, different problems, delicate post-production… Making video remains a real challenge if you want to produce quality content. Would you also like to shoot video? What quality are you aiming for? What will be your publication media? Do you need stabilization? Mechanical or digital? What will be the conditions for filming? Would you like to color grade your rushes? What are your needs in terms of movement, traveling, etc.? Are you going to do editing on the fly or once you get home? It is now possible with the photography gear contained in a backpack to film images that would have required the work of dozens of professionals a few years ago. These technical evolutions enable us to share rich, lively and sometimes unpublished content. Think versatility and study your needs again. Today, it is possible to shoot correct images with almost nothing. Many great videos have been shot with smartphones. These films even have festivals dedicated in many countries. 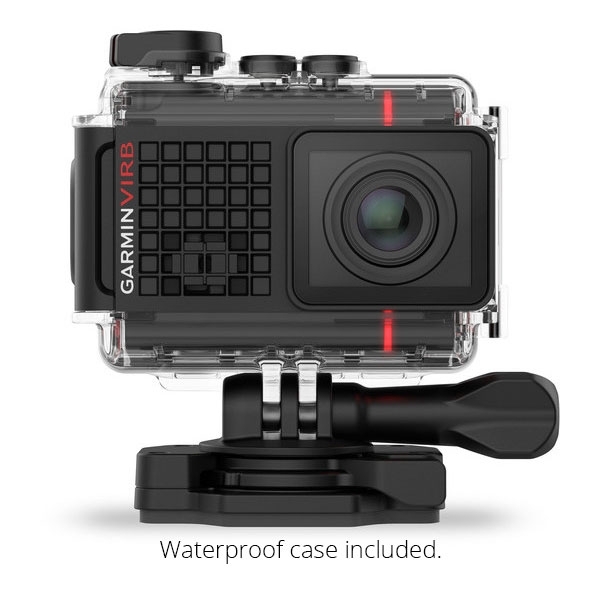 Some of the most recent action cams on the market have an excellent stabilization We love the Garmin Virb 30 for this and it’s more realistic and less contrasted image. The dynamic range of the Garmin Virb 30 is also a great advantage. 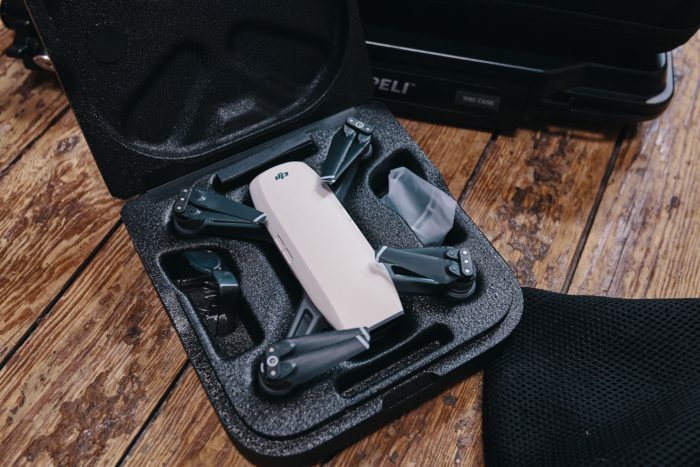 As for the drones, if it has long been impossible to shoot beautiful videos without loading a drone way too heavy and cumbersome during a thru-hike, 2017 was the year of the release of incredible products like the super clever mini drone, Spark from DJI. The Spark weighs some 300 grams and the possibilities it offers are breathtaking! And for both video and photography! As important as the photo for us, shooting videos without cluttering an extra camera was paramount but we did not want to compromise on quality. So we’re looking at a camera that’s as efficient for video as for photography. For camera movements we will equip ourselves with a ultralight Shoulder Rig that can also be used as a tripod. One of the greatest aspect of the Olympus OMD EM1 mkii is its divine internal stabilization. A steady cam? What for? 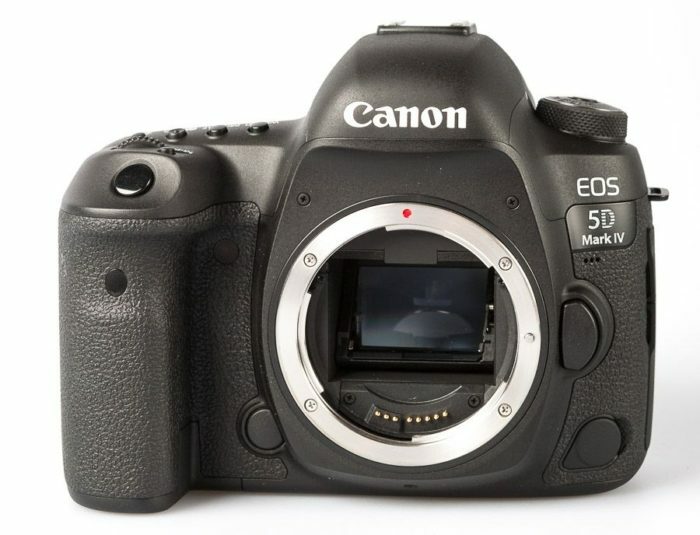 Using this camera we will obtain buttery smooth footage handheld. 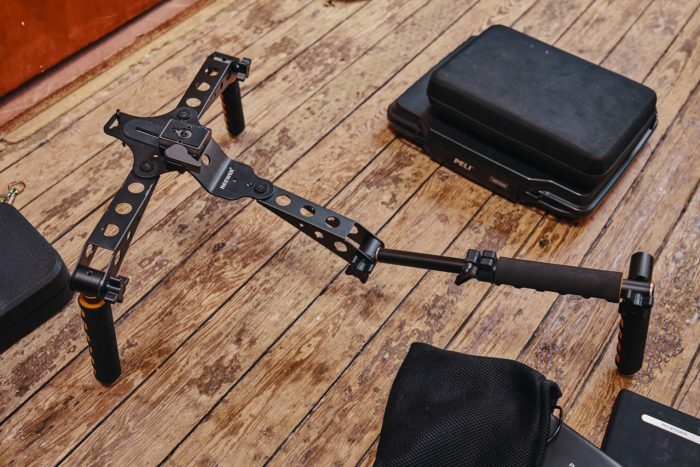 ​​To be honest we are still not so sure we are not going to carry an ultralight shoulder rig. The spider is available for cheap on amazon, and with a minimum of work, you can truly enlighten it, make it smaller, change tubes for carbon etc. Finally, because we think it will be fantastic on a course like ours to be able to capture from the sky the richness of the landscapes that we will cross, we will embark with us a Drone DJI Spark. It’s an unprecedented experience! Ah… The weight! A key point yet so difficult to combine with other factors. Lightness, robustness and quality rarely combine. Are you going for a week-long hike or a thru-hike that lasts several months? What are your carrying capacities? Are you alone? Can the others help you carrying some gear to split the weight ? Are you ready to make concessions on the rest of your equipment? Be reasonable on the weight of the equipment you are embarking! Have you ever tasted the pleasure of ultralight hiking? It is unequivocal! In the case of a thru-hike, if your goal is photography as well as sporty, you may be tempted to carry more material than you need. That would certainly be a serious mistake. Overloading you in addition to being traumatic for your body will slow you down and will definitely end up disgusting you from the hike. With 2PVA, we attach great importance to photo and video content. We will make a lot of concessions on our outdoor equipment, clothing, camping gear, which will be de facto, minimalist. Our total photo and video equipment should be between 6 and 8 kilos. You can equip yourself for a few hundred euros or several thousands… choose your poison. Is there high risks to break your equipment at some point? Do you buy material that you know does not lose value too fast? Is the equipment second hand? Reconditioned? Photography and video making being a large part of the adventure, we are investing in quite expensive gear. But not without the best insurance! 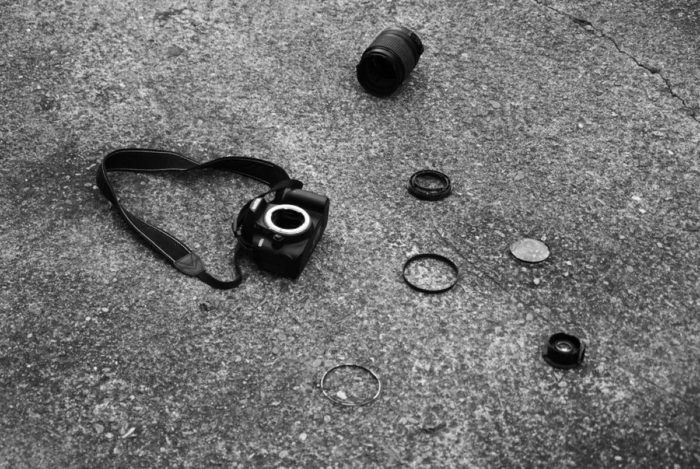 Take the best care of your camera, no matter the price, if you work with it, cherish it. In most situations, the battery life of your photography equipment is not a decisive factor. 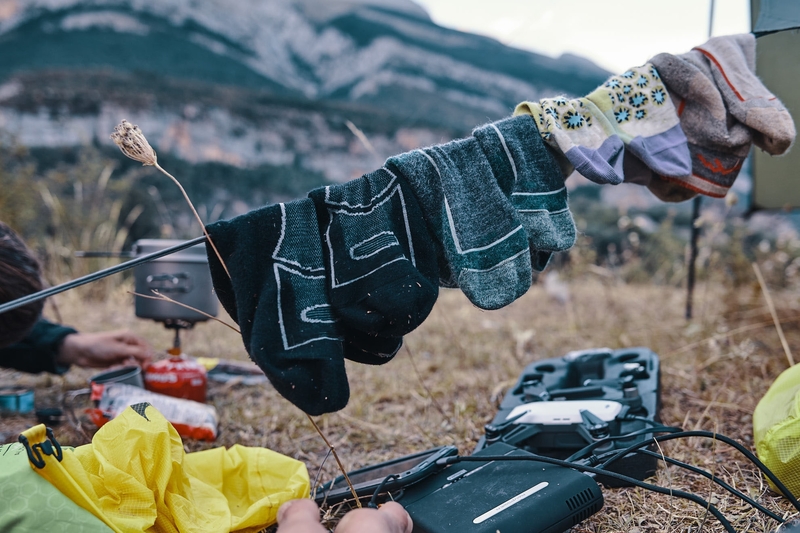 In the case of thru-hike, or simply long distance hiking where access to electricity can be rare and the weight of batteries a handicap, this becomes then a real subject. What is the consumption of the equipments you embark on and their autonomy? Will you always have access to electricity? Do the devices recharge in usb? And with an external battery? A solar charger? It is a parameter that I advise you to really study if you are led to feed a regular chronicle or are compelled to a frequent sharing of media. Compact devices are lightweight but they often consume a lot of energy (screen, etc.). In addition, their batteries are often small and the charging can become actually more complicated. A bit like cars, the less electronics, the less risk of battery problems. A Reflex camera has the advantage of not needing a screen so that you visualize your image what makes you save precious cell duration. I often tell myself that you need to manage battery autonomy just like you would do with water supplies 🙂 You do not want to run out of battery when arriving on a summit for sunset. 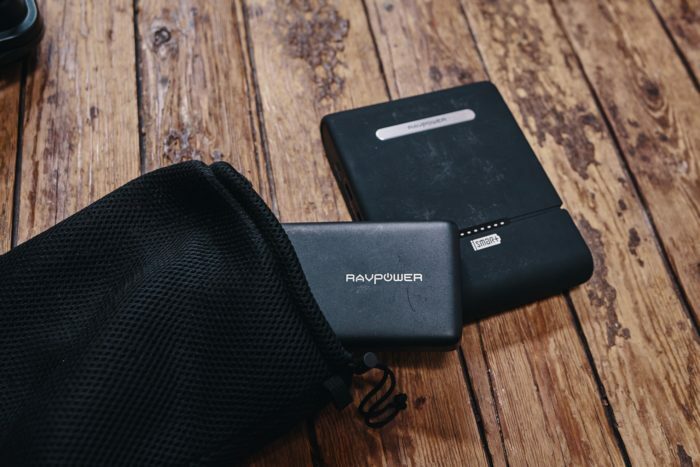 With constant roaming we wanted to be sure we would never run out of battery and opt for the least restrictive solution. In addition, we arrange for all our devices to be able to charge in usb, including computer and use a fast multiple charger, which allows us to centralize the charging and save valuable time and weight. 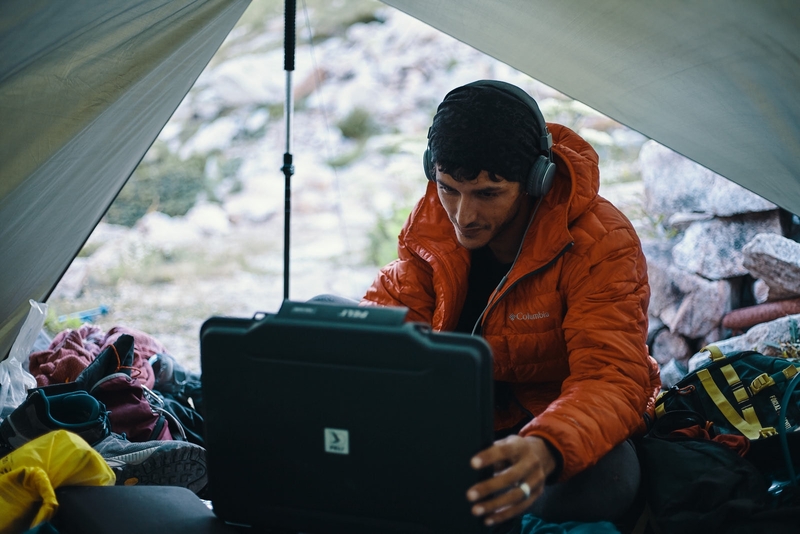 In the case of long stays, thru-hike or not, also comes the whole issue of processing files. Depending on the need for instantaneous project, you may need a computer or a tablet. The entire equipment must then be seen as a chain which must be perfectly oiled. A computer that meets the same criteria as your hardware, lightweight, robustness, quality (power), good care service, low power consumption… your system must be flawless, your software must work perfectly, and everything must be protected. Working on the trail isn’t something easy. You need to build a perfect workflow. Should you develop your images and edit your videos on the go? Do you have deadlines to respect for your photo reports or videos? Can you edit everything when you get back? Are your devices all compatible with each other? 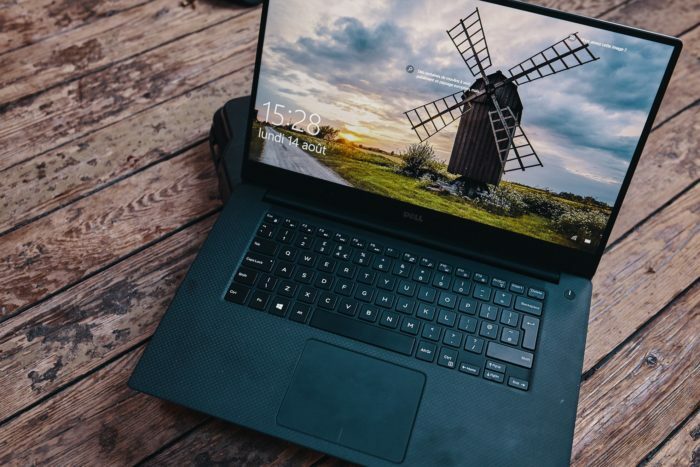 Some recent models of notebooks on the market benefits a small volume, weight and are packed of power, of course the Dell XPS 15 which is an absolute bomb but also the Macbook Pro 15 inches, the Gigabyte Aero 15, and the Razor Blade 2017. I strongly discourage you from overloading yourself with a computer if your needs do not require you to do so, even in the case of very long hikes. If you do not have to deal with HD video, many alternative solutions such as hybrids or tablets are possible, these often offering enough power and having a good screen to work on pictures. If you are looking for a worked post-production on video, then a computer will prove more convenient. The tablets, although functional, remain too weak and dedicated softwares are not developed enough for heavy operations. 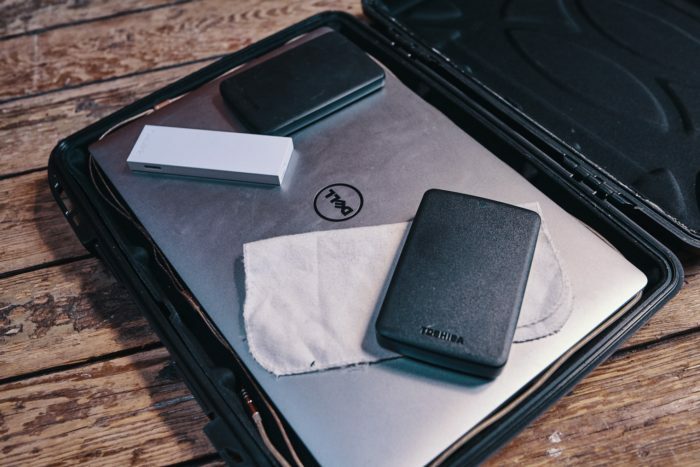 Finally, you will need to think about storing data, potential sending to friends to dump your hard disks or usb keys. Depending on the weight of your media and your organization, you will study the price / weight / capacity ratio without forgetting of course the speed of transfer which too slow, would be preventing you from working from your external disks and therefore waste a precious time over the battery life. Establish a flawless workflow before departure., store well your media, label your storage media … Organize! For the storage solutions, we are not yet decided but we study closely the SSD, usb keys, memory cards… Everything is possible, it is a difficult reflection but we want our data to be safe. It is impossible to send a hard disk without making backup files. We will update the article to keep you informed of our choices. Whether you’re going for 3 days or a year, whether you’re looking to power a blog or shoot large-format photos for exhibits, your needs are different and the issues that arise will be different. In any case, time spent doing a thorough market research will certainly save you a lot of white hair and should bring answers to many of your questions. If you have the opportunity, test the equipment. Opportunities can be more or less rare depending on your place of life but if you have the opportunity, do it! You will not always find all the information in the manufacturer’s manuals. During your search, you will see a little bit of alternative information, hacks and tricks that often make the best of your devices. YouTube is a gold mine for all this information. The amount of websites offering hardware testing is astronomical, do not be discouraged, read and read between the lines. Multiply sources and cross-reference information, stopping after the reading of one good test would be a mistake, paid reviews are numerous. If necessary type your searches in other languages, and do not hesitate to let Google translate, although imperfect, translation will release key information about an article. Finally, look around for accessories available, it may be advisable to opt for a device for which manufacturers offer versatile accessories or good protections. We truly hope this will help you to see clearer through your next investments! 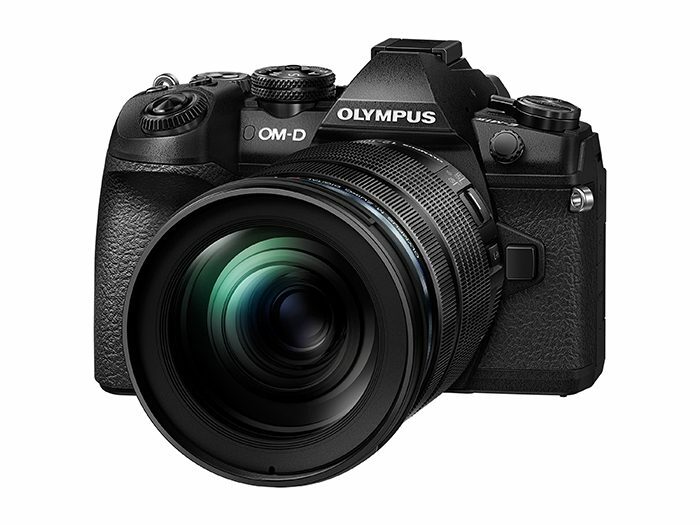 I have the Olympus OM-D EM-5 mk ii that I love to take with me backpacking. I usually take two lenses with me. A 14-42 and a 40-150. If I think I can do some night photography, I will take my 17mm 1.7f prime lens as well. With all 3 lenses, a joby gorillapod, 2 spare batteries, detachable flash, and the Peak Design Capture Clip Pro, the total weight for my setup is 3.38 pounds. The frame is also weather sealed, so if you buy the Olympus Pro lenses, you have a fully weather sealed camera which is nice for the back country. 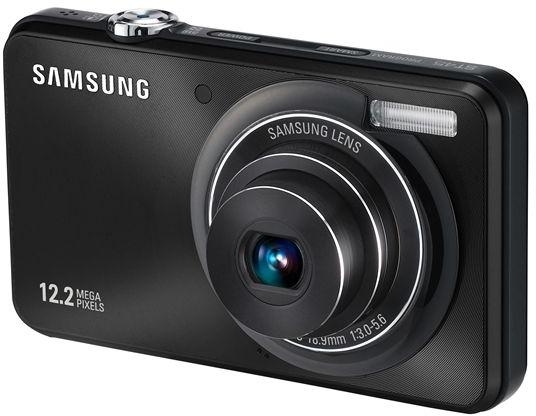 Sadly, I have decided that is too much to to take on my 2018 thru hike attempt of the AT so I am planning on using a Samsung Galaxy S7 and the camera case that has two little lenses that can be screwed on. One for a wide angle show and another that has a 2x zoom. Since the camera can take photos in RAW form, I will still be able to get some good editable shots. I might have someone mail me my Olympus when I get to the White Mountains, but I think that the Galaxy will do a good enough job that I won’t need it. Sorry for the late reply Nate ! Hmmmmmm what a dilemma !! As being a photographer it is always a complicated choice for me too. I would love to know more about you. As being a big fan of high apertures jumping to a smartphone is often heartbreaking ! You will see soon enough if you really need it ! I have never felt cheating on my ultralight wishes carrying photo equipment. Sometimes it is harder on the road, but when i come back home, i always know why i did it.